LOS ANGELES — Looking smart in a blue button-down shirt, Jorge Magana, 18, zipped through a PowerPoint presentation with the confidence of a Fortune 500 CEO. Seated in front of Magana in a classroom at Los Angeles High School of the Arts was a panel of three judges: the school’s assistant principal, a school coordinator, and a former student. The occasion was his senior defense. Magana was trying to convince the panel that he was ready to graduate. He had 45 minutes to present a portfolio of three “artifacts,” one academic, one artistic, and one of his own choosing. The panel grilled him: Can you describe your research process? Which obstacles did you face and how did you overcome them? How will the skills you learned help with your future plans? Portfolio assessments like this one, which look a lot like doctoral dissertation defenses, are on the rise in California. The practice, touted by educators nationwide as a proven path to college success, has largely been squeezed out by standardized tests, the quicker, less-costly measure of student performance. But the state’s reliance on test scores to rank school performance is about to change, and educators see an opportunity. Since 1999, California has primarily tied school rankings to test scores, using the Academic Performance Index (API). Since its repeal in July 2013, the three-digit ranking has been undergoing revision. On the new API, which will debut in the 2015-2016 school year, test scores will account for only 60 percent of a school’s ranking. The other 40 percent will factor in graduation data and “proof of readiness for college and career.” Portfolio assessment can supply this data. The tricky part is convincing skeptics that these assessments are reliable. Magana’s presentation seemed to come off smoothly. He started with the personal statement he wrote for AP English about his father’s alcoholism and its effect on his family. 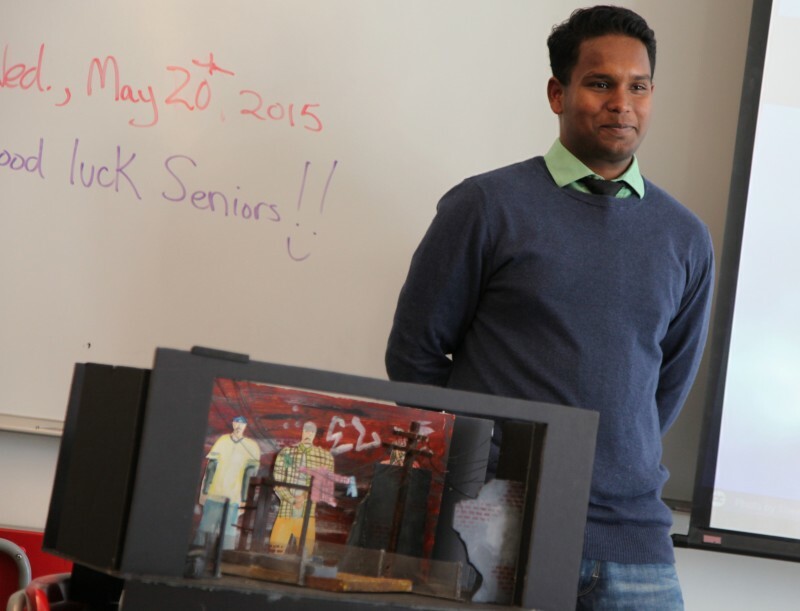 Then he presented a model of a set for the play “Electricidad” that he built for Advanced Scenic Design class. He finished with a policy memo he wrote for AP Government on the high cost of rehab. But when the panel asked him specific questions, Magana stalled. “What policies already exist to help those who can’t afford rehab?” asked Cathy Kwan, the high school coordinator who is developing the portfolio model. She schedules the defenses, recruits panel members, and trains teachers. Magana fell silent and looked off to the side. He had just argued in the memo that the price tag for alcohol rehab is prohibitive for minimum wage earners and that there should be policies in place to ensure alcoholics can get the help they need free of charge. 40 — the percentage of a California school’s ranking that will be based on data other than test scores in the 2015-2016 school year. The verdict: Magana would have to rewrite the policy memo and defend his work again. Kwan is struggling with the difficulty facing any educator hoping to use the portfolio model: defining a standard approach to evaluation. Harvard education professor Daniel Koretz knows this difficulty firsthand. He studied the portfolio models of Kentucky and Vermont in the 1990s, when those states were trying to replace standardized tests with portfolio assessments. The criteria for what makes a good portfolio, Koretz found, can vary widely from school to school, making comparisons difficult. “The standardized assessment is standardized precisely so that there is nothing extraneous that differs between kids or between schools,” he says. This problem has sent educators in California searching for an objectivity not usually associated with portfolio assessment. A recent report from Stanford University professors Soung Bae and Linda Darling-Hammond promotes graduation portfolios as one measure of how well schools prepare students for college. The authors recommend that the state allow schools to use “well-designed” portfolios, comprised of work from each of five different subject areas to include research essays, art work and other sophisticated projects that can’t be captured on a test in place of traditional exit exams. The resulting online tool, ConnectEd Studios, tries to take the subjectivity out of evaluating portfolios. Students can earn digital badges for completing performance tasks. A student writing an argumentative essay, for example, can upload the essay to the site, where his teacher can evaluate the writing according to a scoring rubric with criteria for grading. A series of dots represents the progress of the essay: red dot (ungraded), purple dot (not proficient), and green dot (proficient). When the essay is deemed proficient, the student earns a badge. The development of reliable portfolio assessments could have huge implications for how we judge school effectiveness, not just in California but nationwide. Yanofsky estimates that 20 school districts, including Houston and Philadelphia, have expressed interest in working with ConnectEd to build their portfolio programs. The expectation is that an online platform like ConnectEd Studios would create a secure place for students to share videos, audio files, photos, writing samples, digital badges, resumes, and letters of recommendation, showcasing their qualifications for universities and potential employers. Related: Can we really prepare kids for both college and career? 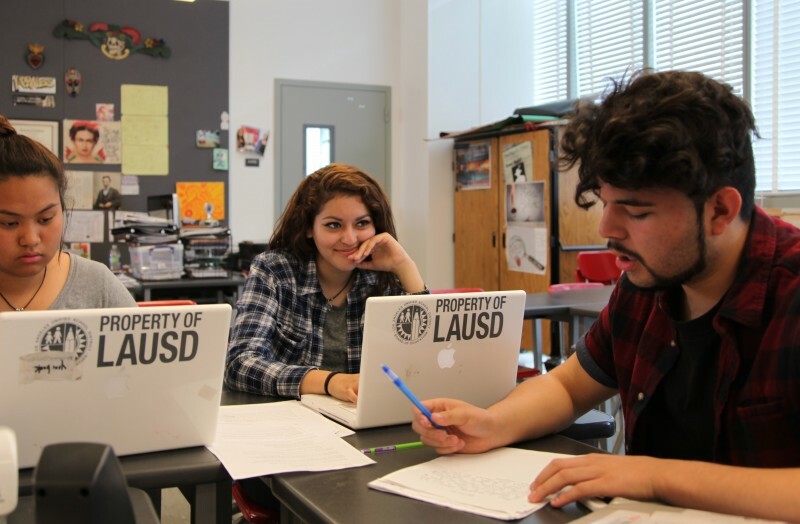 For now, the goal at the Los Angeles Unified school district is to make the portfolio defense a graduation requirement. Ten high schools are piloting the initiative, and there are plans to get more schools on board next school year. 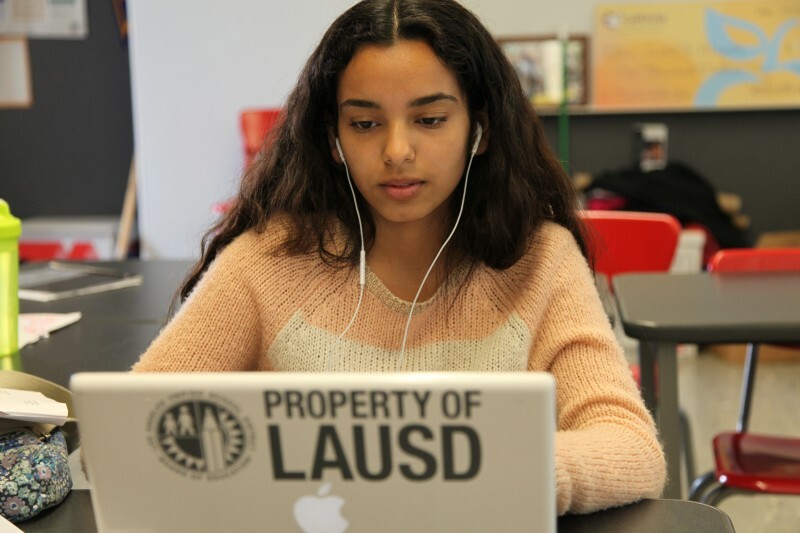 Half of the Los Angeles Unified schools testing portfolio defenses have partnered with Envision Schools, a network of three small charter high schools in the San Francisco area that has systematized the portfolio model over the past 13 years and can provide step-by-step instructions on how to build a portfolio program. 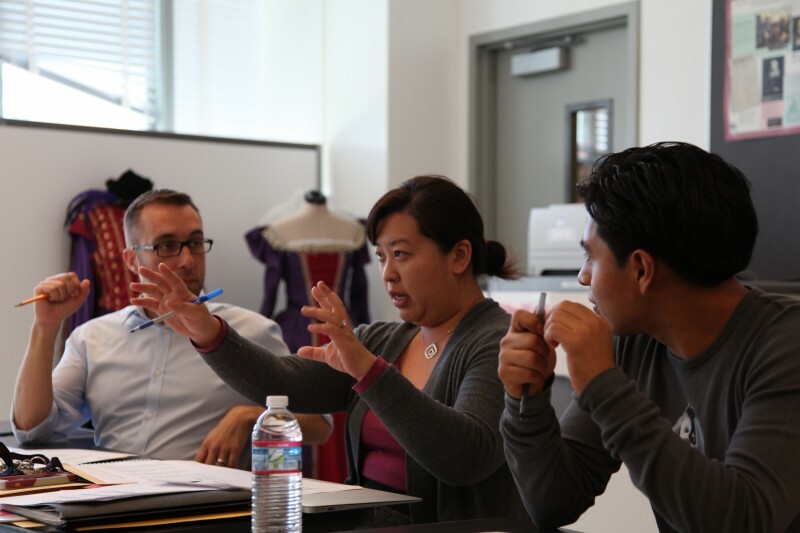 L.A. teachers traveled to San Francisco to watch the Envision students defend their portfolios and to get training on how to critique them. Envision has shared videos of model defenses and scoring rubrics that L.A. teachers can revise to suit their schools’ specific needs. Can Portfolios Make the Grade? At first, many teachers at Los Angeles High School of the Arts thought the defense was an unnecessary torture. Then, they actually witnessed a defense. Morales says students can simply “go through the motions” in class, taking in information without really retaining it. But portfolio defenses force them to explain what they’ve learned, and to apply it in different ways; for instance, Magana tackled the issue of alcoholism as a statement on policy and in a personal statement. Since the portfolio program started, Morales has discovered that the best preparation for a portfolio defense is for students to share their work and reflections on what they learned in the process, something she didn’t always make time to do. 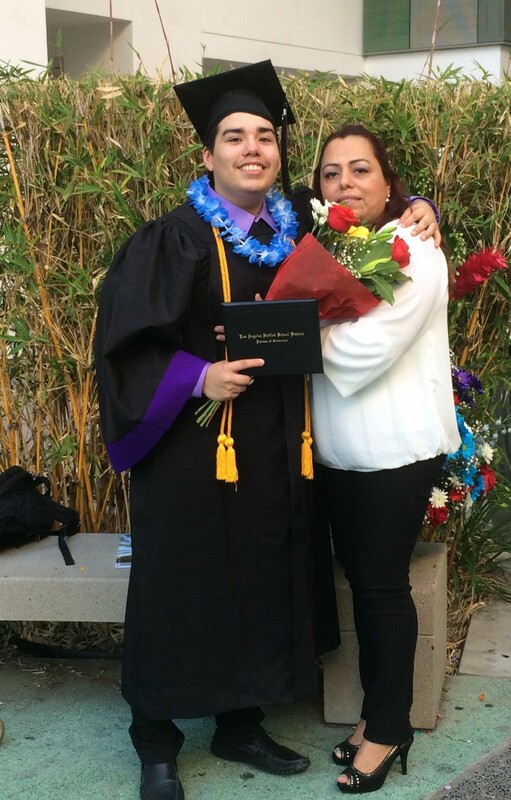 According to a survey of students at Los Angeles High School of the Arts, 90 percent of students who passed and 68 percent of students who failed said the portfolio defense was a “worthwhile experience.” Magana, who passed his second defense a week later, says he’s learned from his mistakes and won’t repeat them at the University of California Riverside, where he’ll major in computer science this fall. Students will also get more opportunities to practice their presentations before the big day. Groups of four will be assigned a mentor teacher who will critique their portfolios and presentations. Eleventh graders will assist during senior defenses, by switching slides or serving as panelists, gaining a sense of what will be expected of them the next year. Tenth graders will participate in mini-defenses in front of their classes. While Kwan is intent on perfecting the process, she worries that portfolio assessment could become rote in pursuit of data. The Envision Schools have the defenses “down to a science,” she says. Students start to sound robotic when they’re all saying the same things, she adds. Success, for Kwan, depends on a continuous evaluation of the process, not on routine. What counts as a real demonstration of learning? 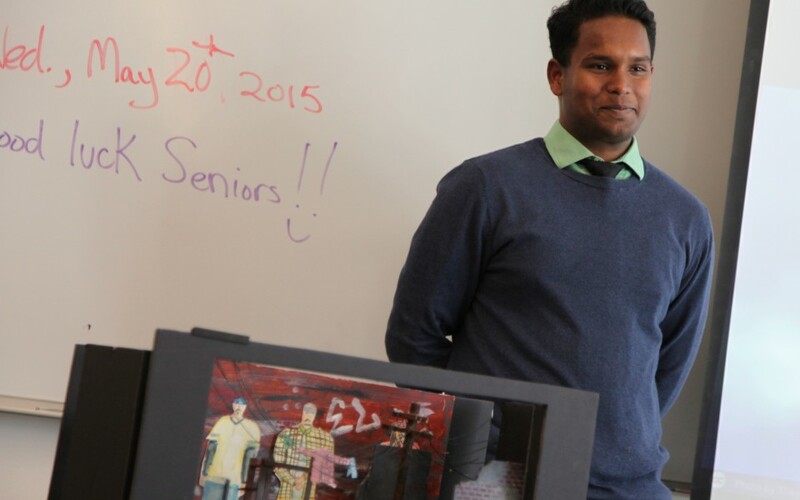 Of the 92 seniors who defended their portfolios this year, 33 failed. Like Magana, they were scheduled to redo their presentations. But, in the end, all students passed and nabbed diplomas. This story was written by The Hechinger Report, a nonprofit, independent news organization focused on inequality and innovation in education. Read more about California schools. *Correction: Dave Yanofsky’s title has been corrected to reflect his position as the director of media and youth development at ConnectEd. Can a California charter chain ditch tough discipline and retain its high ranking?